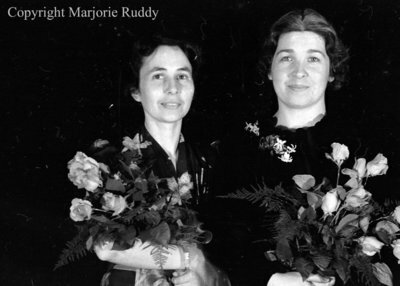 A black and white negative of Kathleen Rowe and Eleanor Beecroft after a concert at the Whitby United Church on May 3, 1948. Both woman are holding bouquets of roses. Kathleen Rowe was born in Reach Township on 12 March 1903, and was married to Vernon Rowe at Whitby on 7 August 1930. She studied music at the Ontario Ladies' College, Whitby and was an accomplished pianist, teaching piano at the College until her marriage. She taught vocal music in elementary schools in Cartwright Township and piano and vocal music in Port Perry. Mrs. Rowe was Music Supervisor in the Whitby Public and Secondary Schools for 25 years, from 1933 to 1958. Many of her choirs won prizes at the Kiwanis Music Festivals. She was Organist and Choir Leader at St. Mark's United Church for 30 years, and for many years directed the Rotary Minstrel Shows starting in 1947. Mrs. Rowe died at Oshawa General Hospital on 19 January 1958, and is buried at Mount Lawn Cemetery. On 17 December 1959, the Kathleen Rowe Memorial School was opened, the first Whitby School to be named after a person. Eleanor Chambers Norton was born in London, Ontario on 8 September 1906. She married Julian Balfour Beecroft on 18 November 1931. Together they had five children: Eleanor Jane, Norma Marian, Eric Edmund, Charles Andrew Stuart and Carolyn Ruth. Eleanor passed away on 20 September 2007 and is buried at Mount Pleasant Cemetery, Toronto, Ontario. Kathleen Eugene & Eleanor Beecroft, May 3, 1938, Marjorie Ruddy. Whitby Archives A2013_040_978A.